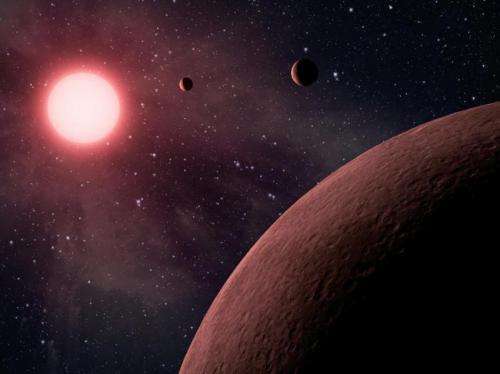 An international team of researchers has identified 'fingerprints' of multiple metals in one of the least dense exoplanets ever found. The team, from the University of Cambridge and the Instituto de Astrofísica de Canarias (IAC) in Spain, used the Gran Telescopio Canarias (GTC) to observe WASP-127b, a giant gaseous planet with partly clear skies and strong signatures of metals in its atmosphere. The results have been accepted for publication in the journal Astronomy & Astrophysics. WASP-127b has a radius 1.4 times larger than Jupiter but has only 20% of its mass. Such a planet has no analogue in our solar system and is rare even within the thousands of exoplanets discovered to date. It takes just over four days to orbit its parent star and its surface temperature is around 1400 K (1127° C). The observations of WASP-127b reveal the presence of a large concentration of alkali metals in its atmosphere, allowing simultaneous detections of sodium, potassium and lithium for the first time in an exoplanet. The sodium and potassium absorptions are very broad, which is characteristic of relatively clear atmospheres. According to modelling work done by the researchers, the skies of WASP-127b are approximately 50% clear. "The particular characteristics of this planet allowed us to perform a detailed study of its rich atmospheric composition," said Dr Guo Chen, a postdoctoral researcher at IAC and the study's first author. "The presence of lithium is important to understand the evolutionary history of the planetary system and could shed light on the mechanisms of planet formation." The planet's host star, WASP-127, is also lithium rich, which could point to an AGB star – a bright red giant thousands of times brighter than the sun – or a supernova having enriched the cloud of material from which this system originated. The researchers also found possible signs of water. "While this detection is not statistically significant, as water features are weak in the visible range, our data indicate that additional observations in the near-infrared should be able to detect it," said co-author Enric Pallé, also from IAC. The results demonstrate the potential of ground-based telescopes for the study of planetary atmospheres. "The detection of a trace element such as lithium in a planetary atmosphere is a major breakthrough and motivates new follow-up observations and detailed theoretical modelling to corroborate the findings," said co-author Dr Nikku Madhusudhan, from Cambridge's Institute of Astronomy. We are just starting to probe the atmospheres of exoplanets with ground-based telescopes, but the authors believe that this will also be a reference exoplanet for future studies with space telescopes such as the James Webb Telescope, the successor to the Hubble Telescope. These future studies will reveal the detailed nature of WASP-127b as a benchmark for this new class of very low-density exoplanets. The WASP-127b observations were conducted using the OSIRIS instrument of the GTC, from the Roque de los Muchachos Observatory, in Garafía (La Palma).